The Sarasota County Sheriff’s Office is currently investigating a murder. On Friday, March 8th 2019, Christopher R Ramos was found murdered inside his home in the 2100 block of Banneker Way in Newtown Estates. The Sarasota County Sheriff’s Office is asking that anyone with information regarding this case please contact Crimestoppers of Sarasota by calling 941-366-TIPS or online at www.sarasotacrimestoppers.com. If your information leads to an arrest, you are eligible for up to a $3,000 reward and will remain anonymous. You can submit a tip via your mobile device as well, by downloading the "P3" app. The Sarasota County Sheriff's Office is currently investigating two Thefts and a Fraudulent Use of Credit Card that occurred in February. On 2/16/2019, a victim's credit card was stolen from his locked locker at Planet Fitness in Venice. The pictured unknown male subject attempted to use the stolen credit card at the Target in Venice which was declined. Then on 2/17/2019, a second victim had his credit card stolen from his locked locker at L.A. Fitness in Venice. The same subject who attempted to use the stolen credit card on 2/16/2019, used this victim's credit card at the Target in Venice, the Walmart in Osprey and the Best Buy in Sarasota. The Sarasota County Sheriff’s Office is currently investigating a fraudulent use of credit card case that occurred in February. The pictured female has used stolen credit cards from an Assisted Living Facility in Manatee County (Cypress Springs, 9085 Town Center Pkway). This female has subsequently used the victim's credit cards in Sarasota County. The total financial loss for both victim's is approaching $10,000. If you have any information on the suspect, please contact Crimestoppers of Sarasota by calling 941-366-TIPS or online at www.sarasotacrimestoppers.com. The Venice Police Department is currently investigating an Attempted Homicide that occurred on 02/25/2019. An unknown suspect approached the victim on his lunch break at PGT (1070 Technology Drive, Venice Florida 34292) and called him a snitch before shooting him in the leg and hand. The suspect was described as a White Male, approximately 5’9”, average build, wearing a black hoodie, oversized sunglasses, and wearing green and black PGT gloves. The victim identified the firearm used as a short-barrel revolver. The pictured unknown male subject was caught on surveillance video breaking into an unlocked vehicle on Michaeler St in North Port on 01/10/19 at 03:05 hrs. He is described as 5’8” – 5’10”, wearing a thick winter jacket and a ball cap. Reference North Port PD Case Number 2019-01-0559. The North Port Police Department is investigating the homicide of 20-year-old Tyren Anthony Kinard of Port Charlotte. Tyren also goes by the name “Londonn Moore” in some social media and online platforms. Tyren was found shot to death on Sawyer Circle near the Charlotte County line around 7:30 am on Saturday, September 8th. Crimestoppers of Sarasota by calling 941-366-TIPS or online at www.sarasotacrimestoppers.com. The Sarasota County Sheriff's Office is currently investigating a fraudulent use of credit card case that occurred on 08/09/18. 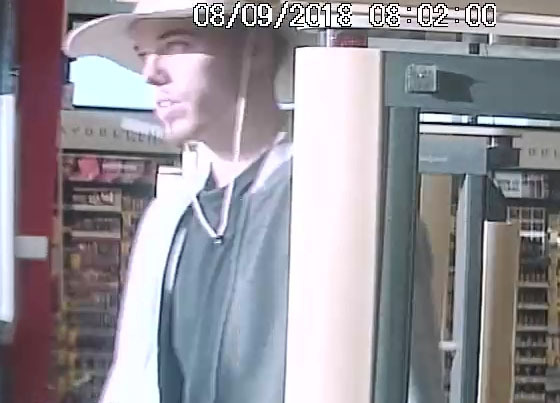 The pictured unknown suspect attempted to use the victim's stolen credit card at Walgreens, located at 1490 US 41 Bypass S, in Venice. The suspect attempted to purchase a prepaid Visa gift card for $250. The charge was declined. The victim believes he left his wallet on top of his vehicle while pumping gas at Shell North located at 13280 Tamiami Trl, North Port. The card was utilized twice at Shell North, and again at the ATM inside Marathon located at 13501 Tamiami Trl on 05/27/18. The unknown subject above was driving a dark gray vehicle, possibly a Volkswagon Passat or Jetta, wth a sunroof and spoiler. If you have any information on the unknown pictured subject or vehicles, please contact Crimestoppers of Sarasota by calling 941-366-TIPS or online at www.sarasotacrimestoppers.com. The unknown female subjects above are part of a ring that are uttering counterfeit checks at supermarkets. The photos above are from Publix located at 1251 S Toledo Blade Blvd, North Port. The victim’s checks are all accounted for, but the account information (checking account number and bank routing number) was on a check for a different bank in the amount of $486.95. If you have any information on the subjects, please contact Crimestoppers of Sarasota by calling 941-366-TIPS or online at www.sarasotacrimestoppers.com. Between February and March of 2018, the pictured suspects have withdrawn over $11,000 from a victim's bank account at Bank of America at 1237 Stickney Point Rd.